Papahānaumokuākea 'Ahahui Alaka'i (PAA) is a 10-day experiential leadership program that brings together teachers, business people, policy-makers, and other community leaders interested in learning and being inspired by science and traditional knowledge management practices. 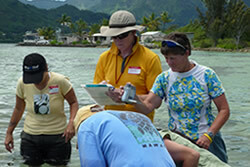 This workshop, being sponsored by staff of Papahānaumokuākea Marine National Monument (Monument), facilitates participants with a broad range of interests and knowledge to achieve active stewardship of natural and cultural resources within their home communities. 'Ahahui refers to society, club or association. Alaka'i is Hawaiian for ambassador or leader. The Hawaiian word /acronym PAA (Pa'a) means steadfast, learned, determined, strong, to hold, keep, retain. The Monument co-trustee agencies (U. S. Fish and Wildlife Service, National Oceanic and Atmospheric Administration, and the State of Hawai'‘i) will select a group of up to 12 people to participate. The first three days will be spent on O'ahu in Hawai'i learning natural and cultural history of Papahānaumokuākea, getting to know the other participants, and preparing for the field portion of the workshop. The remaining seven days will be spent on remote Midway Atoll located 1,250 miles northwest of Honolulu within the Monument. On the atoll participants will be surrounded by millions of nesting seabirds, as well as an incredible assemblage of marine wildlife. Participants will be immersed in a variety of activities using traditional knowledge, science methodology, island conservation and resource management practices while building upon their plans to navigate change back home. PAA accepts nominations from educators in formal and informal settings, community leaders, as well as people in positions that support community change and stewardship. We are seeking participants who are active in their communities, who will promote stewardship, and lead people to action. In each group, we will be seeking a balance of different professions, skills and understandings. We will be looking for a combination of formal teachers from schools, informal educators such as interpreters in national parks, as well as community and business leaders who want to affect environmental awareness and inspire people to take action. We are also seeking people in each group that have traditional ecological knowledge and cultural understanding of Oceania and Hawai'i. Both United States citizens and international nominees are welcome. Due to a number of factors we are unable to offer the PAA program in 2011. Please check back later in the year for a 2012 opportunity. Midway Atoll National Wildlife Refuge and the Battle of Midway National Memorial are part of Papahānaumokuākea Marine National Monument. The atoll includes three small islands - Sand Island, Eastern Island, and Spit Island - in an encircling protective coral reef. Midway Atoll is an unincorporated territory of the United States. The atoll and its surrounding waters are the only area within the Hawaiian archipelago that is not part of the State of Hawai'‘i. Midway still maintains and uses some of the infrastructure that once housed military servicemen and women. Although there are some paved roads, transportation is primarily by foot or bicycle. A limited number of golf carts are sometimes available for the mobility impaired. Renovated bachelor officers' quarters offer the same amenities as a comfortable small town motel complete with towel/sheets and individual bathrooms, or at the minimum a bathroom is shared with one other room. Air conditioning and heating units are available as necessary. In addition, plenty of fresh food is served from a small cafeteria-style restaurant. 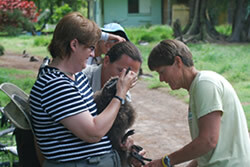 ** Midway Atoll has minimal medical facilities available and no doctors. If serious medical attention is needed, it will be a minimum of 5 hours to fly to the nearest hospital and potentially could be much longer. ** Life on Midway Atoll can be very unpredictable. Flexibility and the ability to cope with uncertainty of airplane departures and arrivals, day-to-day schedules as well as very windy and possibly rainy weather conditions are crucial to the character of those who go. In other words, a "go with the flow" attitude is essential. Food, lodging and transportation costs are covered during the seven day segment of the trip to Midway, including air transportation between Honolulu, Hawai'i and Midway Atoll. Currently a private Gulfstream-1 aircraft is the contracted carrier and can hold passengers along with luggage capacity limited to 40 lbs each. The flight can be delayed pending weather conditions and can take up to 5 hours each way. Costs for flights to Honolulu from other islands, the mainland, or other countries, are not covered by this program. Food, lodging and transportation costs are not covered for the three days of the program on O'ahu. Some bunk-style accommodations may be available. 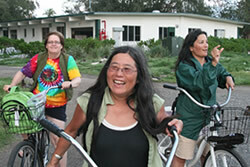 Before leaving for Midway the group will spend three days on O`ahu preparing for their trip. These three days will give participants a chance to learn from and get to know each other, introduce them to the natural and human history in the Monument, preview participant projects, conduct water safety evaluations and learn Hawaiian protocols and cultural practices. The specific work the group will be involved in on Midway depends upon management activities taking place at the time. Activities are likely to include invasive species eradication, snorkeling, and working with bird populations. This once in a lifetime experience will inspire and help participants to carry out their stewardship/action plans. It will also help them articulate how their own community is connected to the Monument and demonstrate ways to help ensure the protection of Monument and global resources. In a position that supports community change & stewardship. Provide evidence of past stewardship/action plans and their success. Have three letters of support from a principal, supervisor, or community that are supportive of your planned project(s). Have a passport that is valid through July 2011. Although not a selection criteria, we strongly encourage individuals to consider the limited medical facilities on the Island (see: Life on Midway). Submit 3 journal entries with digital photographs during and after the experience on Midway. Submit all photos and video collected during the workshop, edited, with key words, and titles. Provide copies of any derived materials - PowerPoints, movies, slideshows, Podcasts, etc to the Monument co-trustee agencies to use at their discretion. Either be willing to be interviewed by media coordinated by the Monument or seek out media opportunities regarding the expedition in their home communities. Give three community or professional presentations on the experience and provide number of attendees and any feedback to the coordinators. Submit a stewardship/action plan relevant to their experiences in Papahānaumokuākea. Implement stewardship action plans and submit one copy of the evaluation and its overall results. Participate in online collaboration with previous participants to share outcomes of their experience, and possibly participate in annual re-unions. If asked, be willing to assist with selection of the following year's group of participants. Twelve participants will be selected. This number is based on the number of passengers able to fit into the airplane going to Midway, and is currently not flexible. We will also be selecting three substitute participants, who may join in the pre-trip preparations, and could fly to Midway if other participants cannot. Participants will be chosen based on their written nominations, their letters of support, and their capacity to fulfill the program's need for a strong variety of skills and abilities to create a balanced group. Completed nominations will be reviewed by previous participants based on a rubric. Top candidates will then go through a final review process by the agency staff to ensure the most balanced and largest pool of talents possible. Each question will help us determine the candidate's ability to fulfill what is required of the participants. The questions are not all weighted the same, with some having more of an influence than others. The corresponding weight is listed on the nomination.